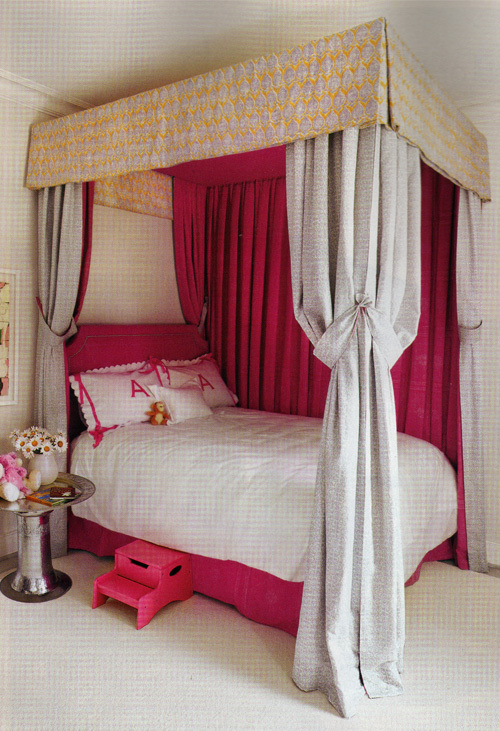 This is the bedroom of Apple Martin, the daughter of Gwyneth Paltrow and Chris Martin of Coldplay. I am sure that the linens alone probably cost more than my entire living room set, but why does this room not speak to me? The bed just seems so imposing for such a little girl, although it could be just the perspective of the photo. But no, those four posters pretty much reach all the way up to the ceiling. Somehow it reminds me of a bed that the Dowager Duchess of Cornwall should be climbing into at night, demanding querulously that her servant place a warming brick at her feet, rather than that of a three year old. Perhaps all the toys, books, photos, and cute little themed rugs were pushed to the other side of the room for the sake of the photographer. And I don’t know exactly why that nightstand bugs me, but it does. Maybe because it bears more than a passing resemblance to a spittoon, it does nothing to endear itself to me. I know for a fact, though, that nobody keeps a vase of fresh flowers right next to a child’s bed. Nobody, not even Gwyneth Paltrow. Especially not with white carpet. You’re just asking for trouble. The only things I like about the room, as far as I can see it from the picture, anyway, are the two little stuffed animals and the pink stool. Because even though the young Miss Martin could probably buy me many times over, no little girl’s bedroom is complete without some stuffed animals. This entry was posted on Friday, October 19th, 2007 at 4:54 am by Glinda and is filed under Celebrity Kids, Celebrity Moms. You can follow any responses to this entry through the RSS 2.0 feed. Both comments and pings are currently closed. I wonder what this room looks like on an ordinary day. I have a friend who is a designer. One of her client’s homes was shot recently for a national publication. When I spoke to her afterward, she was resignedly upset. The magazine employee had brought in many items, removed much of the design done by my friend and installed her own design in the bones my friend had spent years developing. She hated what they did but could say nothing. I wonder if being famous gave Ms. Paltrow any more ability to determine what was actually shot here than my friend. Hopefully little Apple regularly decimates this room and has lavish tea parties for numerous ratty, and well loved toys (and Mom and Dad sitting on the floor with them). I’d have killed for that bed without remorse as a small child. Then again, I was a fairly odd child in a lot of ways. And I would have wanted the linens to be more generally colorful. But a three year old’s room requires more than one, lonely, tiny teddy bear carefully perched among the pillows and two sitting carefully posed on the nightstand. So much white is too hard to clean up when there’s a toddler involved. The flowers on the fugly nightstand are an accident waiting to happen. And no, it’s not just you; that nightstand is an offense against all good taste. I’m not sure I would have gone straight to ‘spitoon’ without your assisstance, but now I can’t see it as anything else. Where’s the cheerful cacophony of chunky toddler toys? This just isn’t natural. There’s just something off about the whole presentation. That bedside table looks like it could hurt you if you fell out of the bed while using it as a trampoline. The putty colored drapings are just bland even though they are paired with the hot pink and the canopy just isn’t doing anything but hanging up there. From a practical point of view, that duvet is a PB&J stain just waiting to happen. I have always wanted a bed like that. I think it would be cool to be able to play hide and seek on my own bed. Plus I love a dark room for sleeping and that bed looks like it blocks out a ton of light. I wonder what that bed would look like after Apple has an early morning pukefest. I bet it would be nasty to clean that bed after. I would have LOVED a bed like that, even as a toddler. My parents gave us twin canopy beds when we were 5 and 4, and we loved them and never had a problem with them. We didn’t have the nice canopy drapes hanging down, though, just the flat canopy cover on the top. At least there aren’t apples stenciled all over the curtains and walls ;-). Oh to have a housekeeper! A white carpet – in a kid’s room? The Dowager Duchess of Cornwall should NOT be having her servants stuff a three year old at the bottom of her bed, no matter WHAT they’re doing in London these days! Also: a very sneaky way to fake the four-poster is simply to hang the draperies from the ceiling, with a fabric panel above the bed. I mean, can YOU see any posts in that picture? The only thing that’s endearing about this is the cute little step ladder. Of course, if you need a step ladder to get into your bed… maybe you need to grow into a bed that size. Liz stole my first comment! The white is a dare; admit it, only wealthy people with a staff would put white in a kid room. And, you know little Apple doesn’t play in there! She probably has a separate room just full of toys and dollies and such. That would explain the lack of the usual toddler detritus. Now, that hideous industrial-chic night table…there’s simply no excuse for that. If, and only if, there is a secret hideout behind that pleated white curtain, it’s the best room ever. Argh, pink curtain, I meant. Reminds me of something Lileks would completely tear apart. Maybe she plays in another room, and they only bring her to bed once she’s fallen asleep somewhere else? ETA: Nony Mouse, I have Lileks open in my other window right now! Do people really give their toddlers beds so high that they need a stool to climb in? Also, housekeeper or no, those drapey things would give lots of kids dust allergies. Hee hee. What would Gnat do with that room?